As mentioned earlier this week, finding a pundit who genuinely believes the Cleveland Cavaliers can win the 2017 NBA Finals is quite a difficult task. The majority of predictions continue to claim the Golden State Warriors are far too talented, with the addition of Kevin Durant making some think it’ll be surprising if the Cavs even win two games. The remarkably few who think Cleveland can come out on top fall back on the same logic – LeBron James. As long as the Cavs have the best player on the planet, you can’t count them out. It’s tough to argue against such a claim, especially when considering the Herculean effort James provided last year when Cleveland fell behind 3-1 against the Warriors. Why wouldn’t you think he’s the most significant player for the Cavs in this series, and therefore the determining factor in whether or not they can pull off a victory? Turns out, James isn’t the X-factor for Cleveland against the Warriors. Well, not entirely. I’m not about to open up some Skip Bayless-esque rant about how James isn’t as good as everyone says. However, in determining the player who has the most impact on the outcome of this series for Cleveland, I don’t think it’s James. Personally, I believe this honor goes to Kyrie Irving. Again, Golden State’s game-plan likely (and unsurprisingly) puts the most onus on stopping James. He’s playing some of the best basketball of his career, a statement which is pretty frightening considering all he’s accomplished to this point. Cleveland will no doubt lean on him as its most important player. One of the biggest keys in James being the most important player, though, is ensuring he doesn’t have to carry the load. While still clearly the most dominant force in the NBA, he’s a little easier to slow down when he’s the lone threat to score. Which is why Irving is just as important in this series, if not more. In Irving, James has someone he can rely on to ease the offensive burden. Someone opposing defenses can’t afford to ignore. Most importantly, someone who’s able to be a major contributor without making James any less imposing. Irving was there to complement James’ 41-point performance in Game 5 of last year’s Finals with a 41-point night of his own. The 27.1 PPG he averaged throughout the series no doubt helped Cleveland in overcoming the aforementioned 3-1 hole. 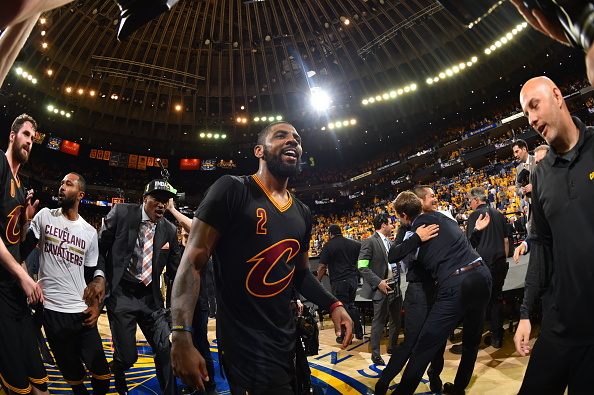 Additionally, Irving, not James, came through with the most important basket in Cavaliers history to win Game 7. James ended up winning the Finals MVP, and deservedly so. But you’d be wrong in assuming Irving’s contributions didn’t lend a huge hand in this. If Golden State didn’t have to respect Irving’s game as much as it did James’, you’re forced to wonder whether or not the latter would’ve been able to provide as much as he did. Such is the case coming into this year’s Finals. James will be the focus for the Cavs, seen by nearly everyone as the one man with the final say on whether or not his team can put up a fight against Golden State. That said, it’s Irving who will be tasked with making sure Cleveland’s superstar doesn’t have to overcome the Warriors by himself. This isn’t to discredit other key players such as Kevin Love or Tristan Thompson. Likewise, the Cavs’ bench unit will also need to step up in a big way throughout this series. However, there’s only one player outside of James who’s just as much of a threat to score from anywhere, and that’s Irving. As a result, his contributions go a long way towards determining just how effective James can be. This is why, once again, he’s Cleveland’s X-factor in the Finals. While James has proven time and time again what he’s able to do on his own, he’s far more dangerous when paired with an equally talented scoring threat. His contributions will always keep the Cavs afloat, but it’s what Irving can bring to the table that can put them over the top.